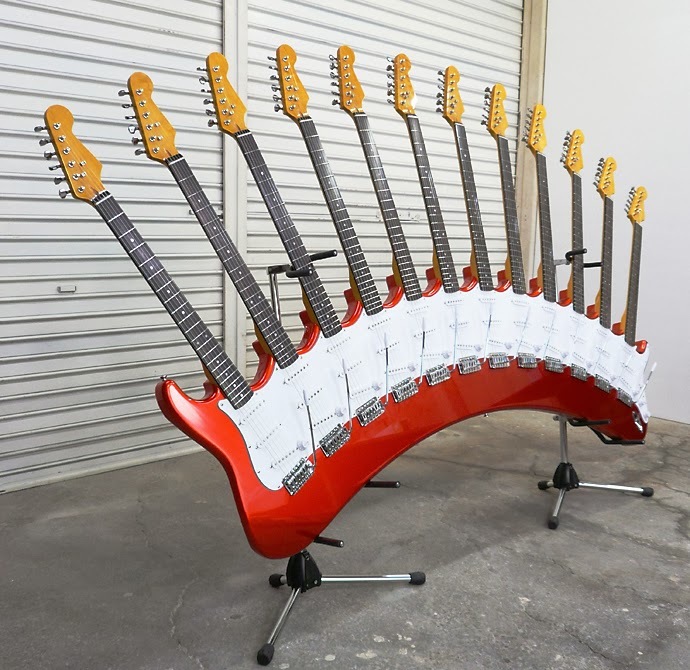 Artist/sculptor Yoshihiko Satoh's approach involves exaggerating iconic & common mass produced objects. Although his subjects span many areas, Satoh is clearly a guitar geek; particularly a Strat geek at that. 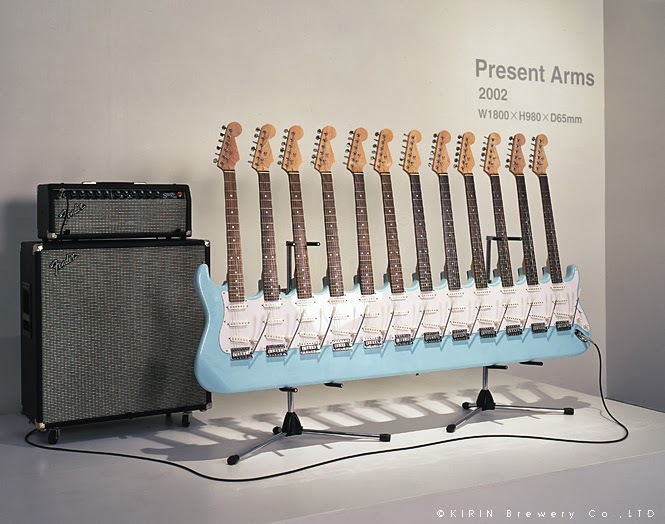 The "Present Arms" series showcases several 12 neck Strats. He's made others besides the 3 pictured above. 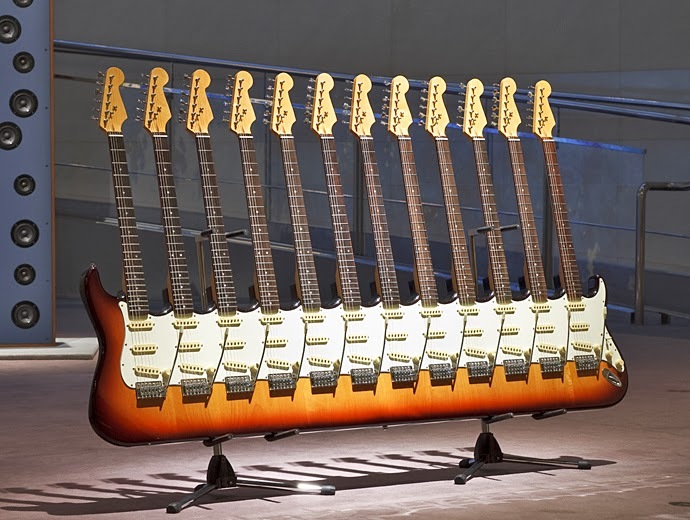 According to a bit of web research, these guitars are reportedly functional too! Imagine the cases! This would really test that new law allowing us to bring a guitar aboard commercial flights. Maybe some sort of Rick Nielsen based Siamese triplet life form kid(s) will show up to play these guitars. Or Rick's adopted son from Krypton. Sure adds a bizarre twist to, "If you build it, they will come..." We probably need to be careful about what we build. Otherwise, the spaceships are landing on the lawn. 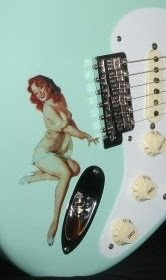 Although I've seen a photoshopped 20 neck version of the Daphne Blue, in Google Images, the above versions actually exist in the flesh, and are featured at the artist's site- see links. 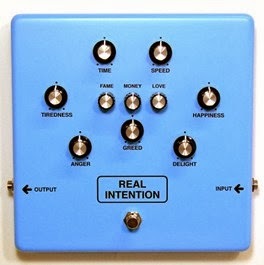 Satoh also created the "Soul Effecter Series" of effects pedals like the "Real Intention". If this one is functional-- it could be a real game changer. Maybe the last pedal you'll ever need. Note: All images from Yoshihiko Satoh website.